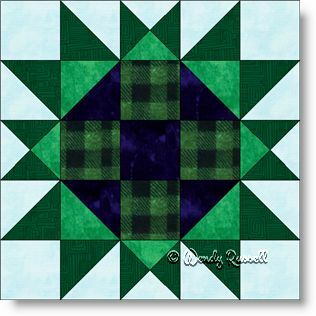 The Star in Square quilt block is a five patch block featuring lots of half square triangles and also quarter square triangles. There are a few squares thrown in for good measure, but overall this is a star block featuring lots of points. It's a good choice for the learning experience of practicing up on your triangle patches and is a nice change from the usual selections for quilters who are beginning their journey in quiltmaking. Even though this block is a five patch, I choose to sew it as an uneven nine patch for the simple reason that I like working in "chunks" rather than in rows. You can choose your preferred method and the end result will still be a stunning block. The sample quilts illustrated use the two standard settings -- a quilt with blocks side by side (and separated by sashing strips) and a quilt set on point with setting triangles and blank squares to showcase your quilting skills. All in all, this is a lovely block for your collection.